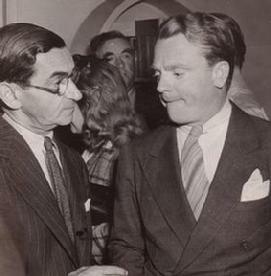 Jack Saleeby and Michael Townsend Wright in "Irving Berlin's America"
IRVING BERLIN--the most popular songwriter in history. No songwriter wrote more hits--or earned more money--than Berlin. And no one has dramatized Berlin's life until now. Deffaa has written five different shows about Berlin! Whether you'd like an intimate show (such as the two-character "Irving Berlin's America," which premiered at the Open Eye Theater), a medium-sized show (the 10-person "Irving Berlin Ragtime Revue"), or a full-scale biographical musical ("The Irving Berlin Story." for a cast of 20, 30 or more players), we have what you need. 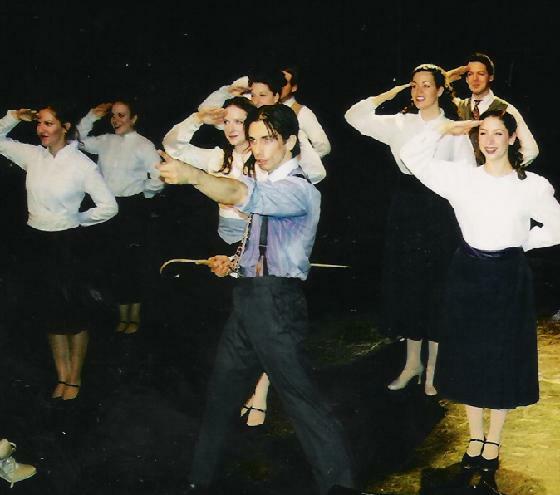 And Deffaa's written the first published one-man show about Berlin, "Irving Berlin: In Person," which recently premiered at New York's 13th Street Theater. The Berlin name--and Berlin songs--are magic! 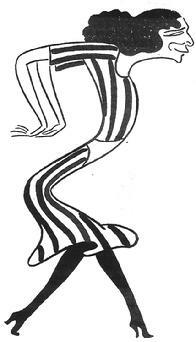 FANNY BRICE--the iconic female superstar. She was, in her time, the highest-paid American singing comedienne; her life inspired such films as "Funny Girl" and "Funny Lady." But--as the New York Times has noted--those films only skimmed the surface; Deffaa has delved more deeply, honestly, completely, in telling her story. Whether you'd like a one-woman show or a big, bright, full-sized musical, we have the shows. All featuring Brice's actual numbers. There are no better vehicles out there for a strong female singer/dancer/actor. Beth Bartley and Michael Townsend Wright in "The Seven Little Foys"
Deffaa's musical "The Seven Little Foys" offers not just solid entertainment values, it's a great FAMILY show, with great roles for kids. And audiences love seeing kids singing/dancing on stage. On this home page, we're touching briefly upon some of the 20 scripts Deffaa has written, all of which are available for licensing. Within this web site, you'll find individual pages for each script, if you'd like to learn more. 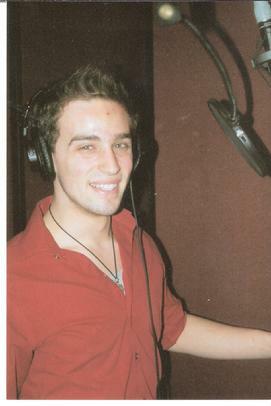 Perusal scripts, original cast albums, demo CD's and/or DVD's are available upon request. 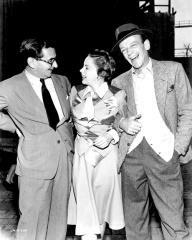 Deffaa may be best known for his celebrations of the roots of show business. But he's also written well-received contemporary original musical plays, such as "THEATER BOYS" and "A FEW MOMENTS AT 'MYSPACE ANONYMOUS.'" Whatever your interests or needs, whatever the size of your venue, we have scripts that will work for you. Cast albums have been released for many of the shows. 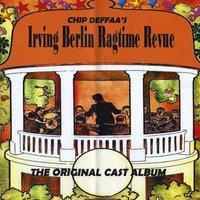 The cast album for Chip Deffaa's "Theater Boys"
The cast album for "The Irving Berlin Ragtime Revue"
Recently released: the cast album for Deffaa's high-spirited musical comedy "THEATER BOYS"--which reviewers have praised as that rarity--an original musical with gay themes that works equally well for gay and straight audiences. For more info on any of these shows, please contact Chip Deffaa Productions at 973-684-3340 or at Footloose518@aol.com. Or Peter Sawyer, President of the Fifi Oscard Agency at (212) 764-1100 or psawyer@fifioscard.com. Catch that Yankee Doodle spirit! 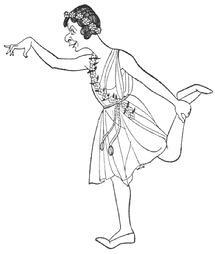 No one in theatrical history ever did so many things so well as George M. Cohan--"the Man Who Owned Broadway." 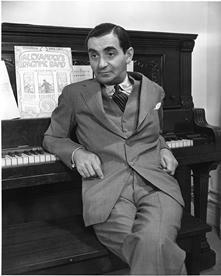 A dynamic entertainer, songwrighter, playwright, director, and producer, Cohan practically invented American musical comedy. 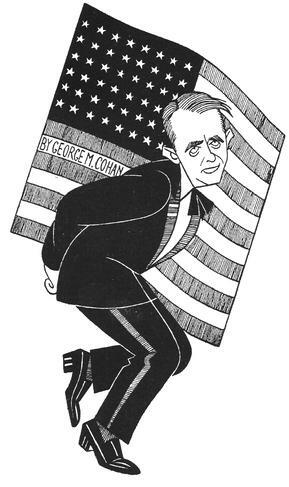 The great Cohan hits--from "Give My Regards to Broadway" to "Mary" to "You're a Grand Old Flag"--are timeless bits of Americana. 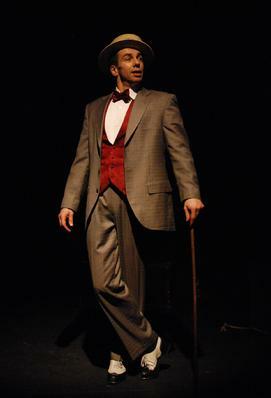 Award-winning playwright Chip Deffaa, the foremost authority on Cohan, has created six sensational shows--suitable for any size venue--brimming with Cohan's rousing music. All are available for licensing or touring. As are Deffaa's other popular shows. 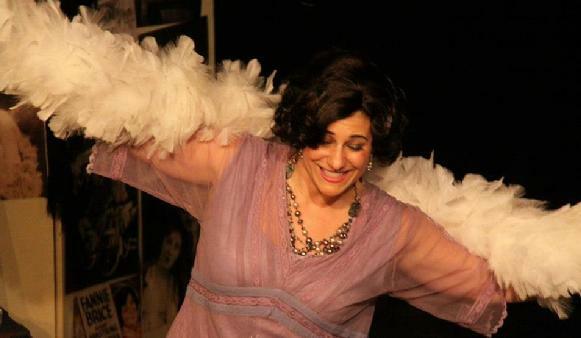 An expert on the roots of show business, Deffaa has created acclaimed shows dealing with such legendary figures as Fanny Brice and Irving Berlin, in addition to musicals created wholely from Deffaa's imagination. There's something for everyone. GEORGE M. COHAN: "...born on the Fourth of July..."
Michael Townsend Wright and Jack Saleeby in "Irving Berlin's America"
"The Seven Little Foys," "One Night with Fanny Brice," "Irving Berlin's America," "Song-and-Dance Kids," "The Family That Sings Together...," "The Johnny Mercer Jamboree," "A Few Moments at 'MySpace Anonyomous,'" "The Irving Berlin Story," "Theater Boys," "The Fanny Brice Story," "Irving Berlin & Co.," and "Presenting Fanny Brice." You can read reviews, find out how to license a script or bo0k a production, purchase a cast album, or get tickets to see a show. Whether you're a performer, a producer, or an audience-member, we have the info you'll need. Cohan's joyously syncopated rhythms just make you feel good. 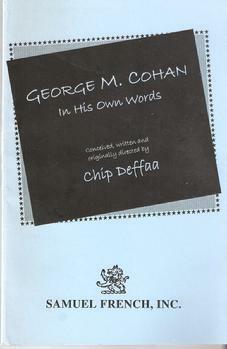 And Chip Deffaa has written--and successfully staged--six different productions celebrating Cohan's legacy--as well as assorted other shows. Deffaa's work has been produced everywhere from New York, to Seoul, to London; his shows have won audiences from small towns to big cities. 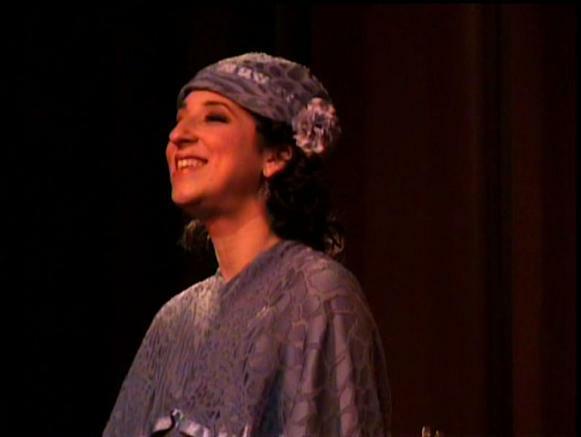 Following successful regional productions, Deffaa's show, "One Night with Fanny Brice," opened Off-Broadway in New York at St. Luke's Theater, in 2011! It eventually transferred to the 13th Street Repertory Theater in NYC. It's gotten great reviews and is available for licensing now. There's no better showcase anywhere for a triple-threat actress. 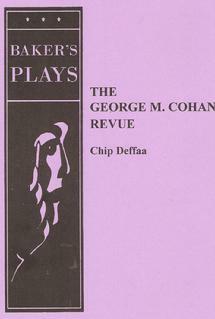 "THE GEORGE M. COHAN REVUE" (published by Samuel French Inc./Baker's Plays) gathers a whopping 60 songs, telling Cohan's life story in two lively acts. 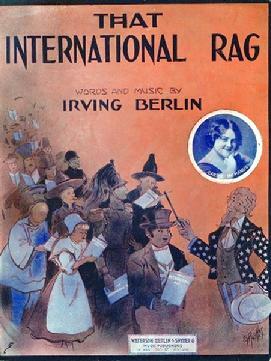 This full-length book musical can be performed by eight to ten singing actors, with an optional chorus of any size. (One school is planning to do the show as their next Spring musical, adding a chorus of 90 on ten of the numbers; but it works perfectly with just eight to ten players.) This song-driven show offers the biggest, brightest representation of Cohan's music ever put together. "YANKEE DOODLE BOY" (published by Drama Source) is a fast and funny, 65-minute one-act musical comedy, written for a flexible cast of six to nine singing actors (with an optional chorus). It's easy to mount, too--which makes it particularly appealing for community theaters and schools. 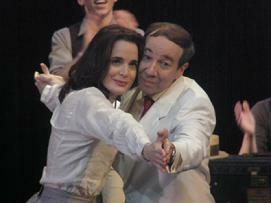 The most recent production was at a school in Katonah, New York; the next will be at a community theater in New Jersey. 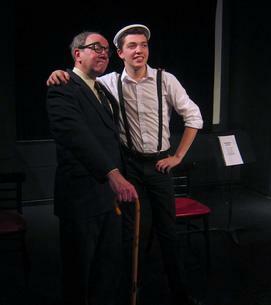 "GEORGE M. COHAN & CO." (published by Eldridge Plays) is a two-character musical play. (The director has the option of adding a handful of other singers as memory figures, if desired; this was done at one recent production, in Millbrook, Alabama.). 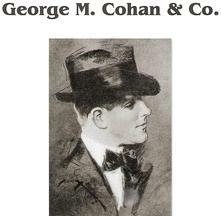 "GEORGE M. COHAN & CO." offers a more thoughtful, intimate look at the man behind the myth. Running time (with intermission): an hour and forty-five minutes. "GEORGE M. COHAN TONIGHT!" is a 95-minute solo show, successfully presented Off-Broadway in New York by the Irish Repertory Theatre, which has wowed audiences everywhere from Milwaukee, Wisconsin and Coral Springs, Florida... to Seoul, Korea and Edinburgh, Scotland! It's now booking tour dates. The cast album is available from Sh-K-Boom Records. This show is a terrific tour-de-force for one strong song-and-dance man! In terms of cast size, "YANKEE DOODLE DANDY" is the biggest of all of Chip Deffaa's Cohan-inspired shows. There are 33 speaking parts, and you can also use a chorus as large (or as small) as you like. The show requires a minumum of 20 performers--some of whom would be "doubling" roles. (The Crystal Sea Drama Co. of San Antonio recently presented this show with a cast of 32.) If you have a school or theater that wants a colorful musical for a large, high-spirited cast, "YANKEE DOODLE DANDY" will be perfect for you. 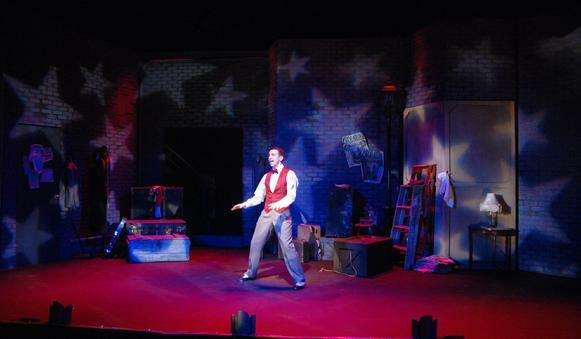 "IRVING BERLIN'S AMERICA" is a two-character musical play about the man many consider to be the greatest of all American songwriters. Certainly no songwriter in history ever wrote as many hits as Berlin. (Even though he never learned to read or write music.) His "only-in-America" success story is inspiring. And such great Berlin numbers as "I Love a Piano," "Alexander's Ragtime Band," and "Play a Simple Melody" are guaranteed to lift spirits. "THE IRVING BERLIN RAGTIME REVUE" is a rollicking, song-driven show, for ten singing actors (five female, five male), featuring 40 of the songs that first put Berlin on the map. This unique, high-spirited revue is not just a celebration of America's most enduringly popular songwriter, it's a celebration of the whole ragtime era. And lots of fun! Nice oportunities for dancing, too! "IRVING BERLIN & CO." is a two-act biographical musical written for 12 players (six female, six male); if you wish, you may add a few extra ensemble members. Great songs, great stories. Perfect for any regional theater, community theater, school or college wishing to celebrate Berlin's legacy with a moderate-size cast. A family-friendly show, easy to stage, that traces Berlin's rise from rags to riches. With more than 30 roles (and the option of having as many chorus members as desired), "THE IRVING BERLIN STORY" is a full-scale musical celebrating the life and times of one of the world's most respected songwriters. This is an ideal show for schools, colleges, regional theaters and community theaters seeking to do a terrific show featuring a big cast. It's packed with enduringly popular songs. And Berlin's rise from poverty to the top of his field is a classic "American dream" saga. 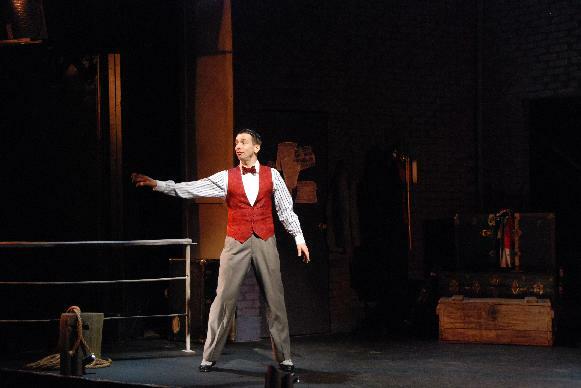 "IRVING BERLIN: IN PERSON" is a one-man show, featuring 30 timeless Berlin songs, carefully chosen because they help tell his life story. Frank and forthright, and brimming with great music, this solo show is a terrific vehicle for a strong singer/dancer/actor. 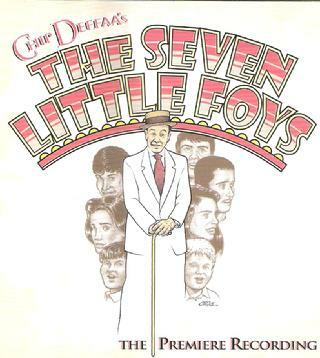 "THE SEVEN LITTLE FOYS" is a full-length, two-act musical comedy, written for three adult actors (portraying Eddie Foy, his wife, and their friend George M. Cohan) plus seven kids. In our world-premiere engagement, the kids often seemed to steal the show. No musical anywhere gives young performers more to do. And audiences love seeing kids sing and dance on stage. This new musical is based on the real story of Eddie Foy, a top Broadway star who took his seven kids into show business with him, becoming the most popular family act of the era. The score mixes nostalgic standards (like "Moonlight Bay," "Meet Me Tonight in Dreamland," and "Some of These Days") with spirited new originals by Deffaa. 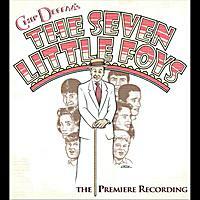 "THE SEVEN LITTLE FOYS" has roles for 10 actors. 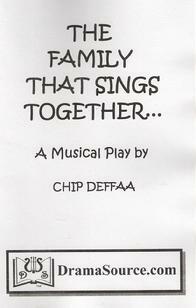 Deffaa has written two other family musicals, inspired by the Foys, with roles for more actors. "SONG-AND-DANCE KIDS" has 37 speaking parts. (Flexible casting is possible; the show could be mounted with anywhere from 24 to 40 players.) This big musical comedy--inspired by the famous Foy family of performers--has lots of humor, lots of heart, and some of the most enduringly popular songs from the golden age of Tin Pan Alley: "In the Good Old Summer Time," "Aba Daba Honeymoon," "Play a Simple Melody," "Alexander's Ragtime Band," etc. 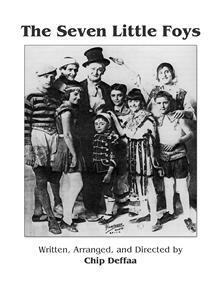 Lots of fun smaller roles, too--including Harry Houdini, Mae West, Marie Dressler, Irving Berlin. 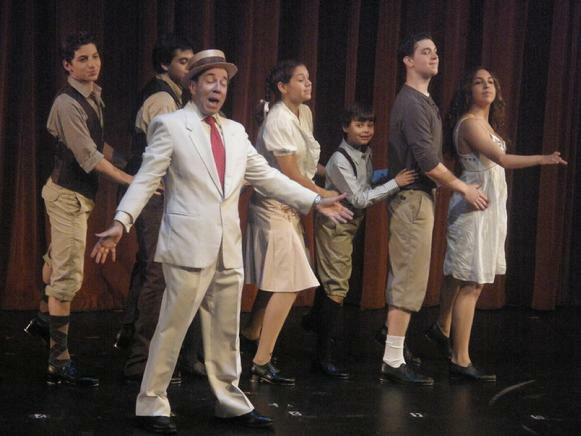 An ideal choice for a school or theater that wants to do an exuberant musical with a big cast. This show will soon be presented at Connecticut's famed Thomaston Opera House. "THE FAMILY THAT SINGS TOGETHER..." (published by Drama Source) has 22 speaking parts. (Flexible casting is possible; this wholesome family musical, set in the vaudeville era, can be performed with anywhere from 16-25 players.) We follow America's favorite performing family as they barnstorm the country, playing everywhere from Thomaston, Connecticut to Salt Lake City. The score includes such old-time favorites as "I Love a Piano," "Has Anybody Here Seen Kelly?," and "I Want to be in Michigan (Down on the Farm)," plus a rousing original by Deffaa, "Faith!" 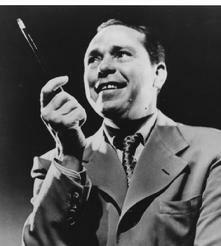 "THE JOHNNY MERCER JAMBOREE" is a two-act celebration of one of America's master songwriters. 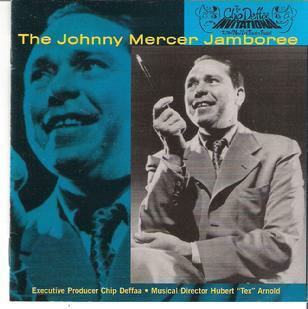 (Alan Jay Lerner called Mercer's songs "pure Americana.") This revue--conceived, written and directed by Chip Deffaa--gathers Mercer favorites that everyone knows (like "Moon River," "Blues in the Night," "Ac-Cent-Tchu-Ate the Positive," "Days of Wine and Roses") along with delightful rarities and rediscoveries. For more info on any of these shows, contact Chip Deffaa Productions at 973-684-3340 or at Footloose518@aol.com. Or Peter Sawyer, President of the Fifi Oscard Agency at (212) 764-1100 or psawyer@fifioscard.com. 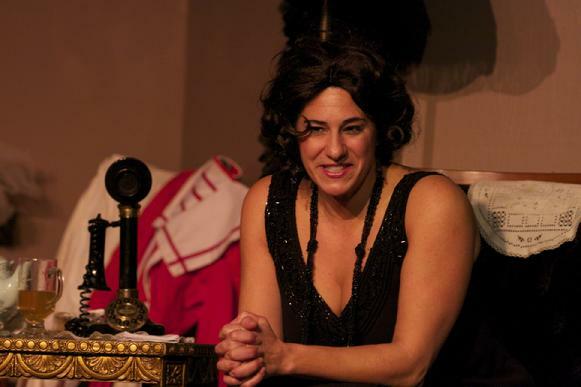 "ONE NIGHT WITH FANNY BRICE" is a one-woman show about the legendary entertainer, which has successfully run Off-Boadway in New York (following several well-received regional productions). Brice rose from humble origins to become the highest-paid American singing comedienne--a Ziegfeld star equally adept at putting over broad comic numbers and dramatic torch songs. 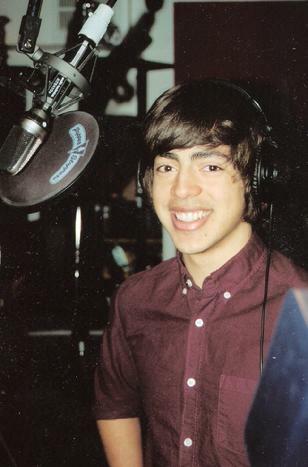 Brice's life story provided the inspiration for "Funny Girl" and "Funny Lady." This solo show features songs Brice made famous, like "Rose of Washington Square" and "My Man." 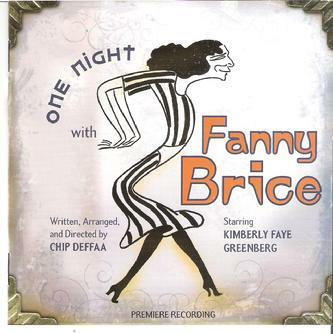 The cast album, starring Kimberly Faye Greenberg, is available from Original Cast Records! 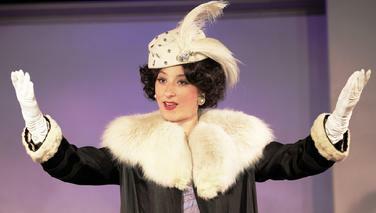 "PRESENTING FANNY BRICE" is a fresh, new big-cast show about the original Funny Girl, published by Eldridge Plays. This terrific musical comedy, boasting more than 30 speaking parts, can be mounted with anywhere from a dozen actors (with some "doubling" of roles) to 40 actors. 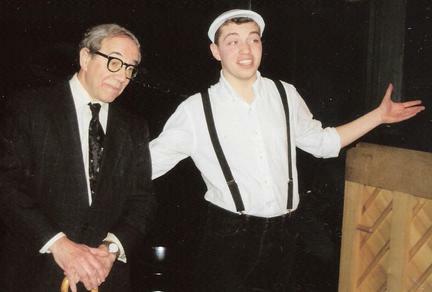 This is a perfect show for high schools, colleges, community theaters, and regional theaters eager to present a story that's both nostalgic and timeless. Plenty of great vintage songs, from "The Sheik of Araby" to "My Man." And plenty of good parts. The role of superstar Fanny Brice, of course, is a dream role for any strong female performer. But this musical also features Gypsy Rose Lee, Walter Winchell, W. C. Fields, Flo Ziegfeld, Fanny's parents, Nicky Arnstein, plus assorted showgirls. 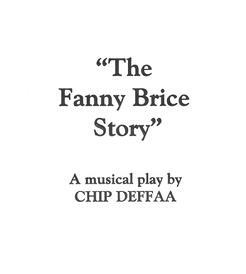 "THE FANNY BRICE STORY" is the biggest of Chip Deffaa's three shows about the legendary entertainer. This family-friendly musical can be performed by anywhere from 15 actors (with "doubling" of roles) to 50 or more actors. The chorus can be as large as desired. (And this show has some really great numbers for the chorus.) This colorful, full-scale musical will be a great choice for any regional theater, community theater, college or school looking to do a big show. The score features more than 30 songs, ranging from comic specialties of Brice (like "Becky is Back in the Ballet") that you'll find nowhere else, to nostaligic favorites that everyone knows (like "After the Ball" and "How Ya Gonna Keep Em Down on the Farm, After they've Seen Paree?"). And this play has lots of intriguing supporting roles: Flo Ziegfeld, Arnold Rothstein, Eddie Cantor, W. C. Fields, George M. Cohan, and Fanny's tap-dancing kid brother, Lew Brice. We've recently completed recording the "THEATER BOYS" cast album, released by Original Cast Records, and available from Amazon, CDBaby, iTunes etc. Watch for it!